On Monday, March 28th I basically did everything in my power to get my body to cooperate and kick into labor. I had my membranes swept, took herbs, used the breast pumped, used oils, got a chiropractic adjustment, had the kids and Roy stay with Ammah so I could relax, vacuumed vigorously, and tried to will my body into labor. By 9:30 I was having regular painless Braxton-Hicks contractions every 10-15 minutes, but nothing strong or uncomfortable. By midnight I was getting tired and was almost ready to throw in the towel and go to bed. I was pretty sure if I did that things would peter out and I would wake up still pregnant. Then I had a few strong and uncomfortable contractions, and one I had to breathe through. I texted my midwife at 12:30, called my mom to come over, woke Matt up and we got the birth pool set up. Only an hour and a half later, at 2:02 am, Bennett Rae came into the world so quickly I caught her myself! She was 21 1/2 inches long, her head measured 15 inches around, and she weighed 10 lbs. 8 oz.! Our biggest baby! We feel so blessed! I think Bennett’s birth story started on Thursday, March 24th. That morning my midwife, Susan, came over and swept my membranes for a second time (something that can naturally bring about labor if the baby is ready), I was having pretty regular Braxton-Hicks contractions (painless, but the uterus “practicing” a contraction…like flexing a muscle), and I had gone to the chiropractor to make sure everything was aligned and ready to go. Then I went to pick Tatum up from school…and she had caught a stomach bug. I immediately felt my body put on the brakes—it knew another baby needed me more at that moment. It was pretty amazing (even if frustrating) how quickly my body stopped any signs of baby coming because I knew my attention was pulled in another direction. Tatum was sick for a few days—the longest she’s ever really been down. But we oiled and rested and while we didn’t go to church on Easter morning, but that afternoon she was doing so much better we got together with family and had our egg hunt and Easter dinner. That day I was one week past due—and soooo ready to have that baby!!! Monday I talked to Susan again and we agreed she would come that evening and sweep my membranes again. All day long I mentally prepared for that baby. I oiled. I did lunges and squats. I snuggled with Kenna and let all those feel-good oxytocin hormones flow. We agreed the girls and Roy would spend the night with Ammah so even if the baby didn’t come I’d have a restful evening. But when Ammah picked Tatum up from school I got a call—her fever was back and she complained that her neck hurt. That’s always a flag to look into things more, and I could feel my body shutting down again. But then my mom went over and we think it was more of the full body ache that accompanies the flu, and she’d just had a little relapse from such a big day on Sunday. So I willed my body to relax. Again, I oiled with every feel-good and relaxing oil I had. I went to my chiropractor again and she straightened me out and hit all the right pressure points to encourage baby (again). I did one last big grocery shop to stock up on necessities. At home I picked up the house, and by the time Susan arrived I was blasting Sia and finishing up vacuuming. She walked in, looking around and nodding and said, “I’m liking the vibe in here” with a big smile. After she swept my membranes (again) and I was about 5 cm, she left me with herb tinctures to take every 15 minutes for the next three hours, and I was going to use the breast pump for 15 minutes on and 15 minutes off. Not only that, but I oiled up, put the diffuser on, drank some Ningxia Red (cause if I was going to have this baby Lord knows I needed energy), and made myself a protein shake. Then I settled down at 9 to start the herbs and pumping. I was having some Braxton-Hicks contractions, but nothing uncomfortable or too strong. And really, they would only show up when I would get up and move around. I started timing them around 9:30, and they were between 8 and 15 minutes apart for the next couple of hours. Pump. Herbs. Oil. Pump. Herbs. Walk around. Pump. Herbs. Oils. Pressure points. Pump. Herbs. Oils. Hip dips. Pump. Herbs. By midnight I still was just having painless Braxton-Hicks, although sometimes they would feel stronger. If you’ve ever been desperate to have a baby you know the crazy feeling of WANTING to feel some discomfort! I was also starting to feel tired. Sometimes the contractions were 11 to 14 minutes apart still—not very encouraging. Matt had gone to bed, and I felt if I just went to bed things would peter out and I would wake up the next morning still pregnant. NOT what I wanted. I had been watching Downton Abbey, but needed something in the background I knew by heart and would elicit those feel-good hormones. Flipping through our DVD library I came across one of my all-time favorites—Little Women. The 1949 version with June Allyson and Margaret O’Brien. Just the opening music makes me happy, and how appropriate since I was about to bring another little woman into this world. Yup, it definitely hit the feel-good buttons! Then I had one pretty strong and uncomfortable contraction. Five minutes later, another one that was definitely not comfortable. A Braxton-Hicks two minutes later, and then a couple of uncomfortable ones 5 minutes apart. I was just thinking about calling Susan, when I had one where I had to actually stop and breathe through. I texted her the contraction record at 12:30 and let her know they were getting uncomfortable—and she responded she was headed our way. I woke Matt up to start blowing up the birthing pool, and called my mom to head over. It seemed odd to get things so prepared with just a handful of uncomfortable contractions, but knowing my body births fast it was better safe than sorry! I got my earbuds in and tuned into my Hypnobirthing tracks and got in the zone. Susan arrived, followed by my mom and Elizabeth who is also a midwife. Susan and some local midwives team up so there are always two midwives at a birth—one for baby and one for mama if needed. They had started filling the birth pool and by 1 am I definitely knew we were having the baby that night. I was having to breathe through contractions and focus on relaxation. I attempted the reclined relaxation position described in the Hypnobirthing book but found I much preferred to be moving around. I went through a lot of contractions sitting on the toilet (it helps you relax down south and open up), and then used the birthing ball while kneeling and rocking over it. I used oils to help ease the discomfort, but by then was vocalizing through contractions. I asked Matt to rub my lower back and hips, and after just a couple more contractions I got the urge to push which was quite surprising! I even said, “I feel like pushing!” and Elizabeth was instantly in the room. From there they let me know the water was warm enough and I ever-so-thankfully climbed in. I wedged my phone in the cup holder of the pool and swayed back and forth with my eyes closed, willing my body to relax and making whatever noises my body needed to make. There was a whole lot of “Oh Jesus” and a few “Have mercy-s” in there! Pretty soon after getting in (I think the water gave my body a few minutes of a break which was much appreciated), I could feel Bennett moving down, and reaching down I could feel the top of her head and learned that we had another baby with a full head of hair. So I think I said out loud I could feel the head, and as the urge to just push the baby out and get it over and done with was taking over my body, I willed myself to slow down, slow breathing, and I held her little head so that it was slowly coming out. I’m not sure what I sounded like on the outside but I did most of this with my eyes closed and in my head I was very calm and talking myself through it. I still had my headphones on so I’m sure that was helping too. 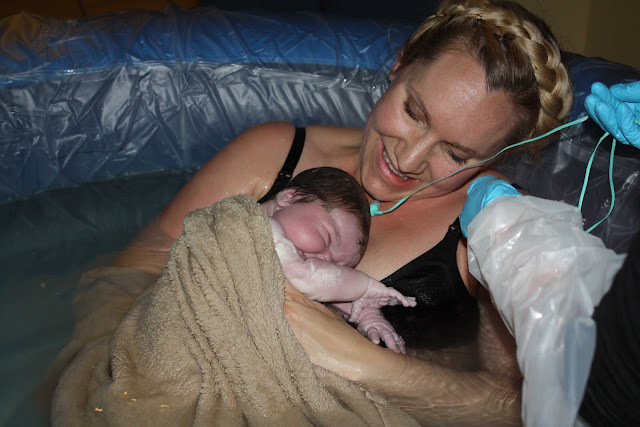 I was on both knees bent over in the water, feeling her head come out, and felt I needed to open my pelvis more to let her birth so I pulled my right leg up so I was just kneeling on my left knee, and as I did that she came out and I pulled her up onto my chest. Honestly, I was so in shock I had just caught my baby that I just leaned back and took a minute with my eyes closed. Bennett Rae was born at 2:02 am. She came out squalling and announcing herself to the world! Only an hour and a half after I texted Susan. Definitely the fastest labor by far! When I had caught my breath I got to take a look at my new little girl. 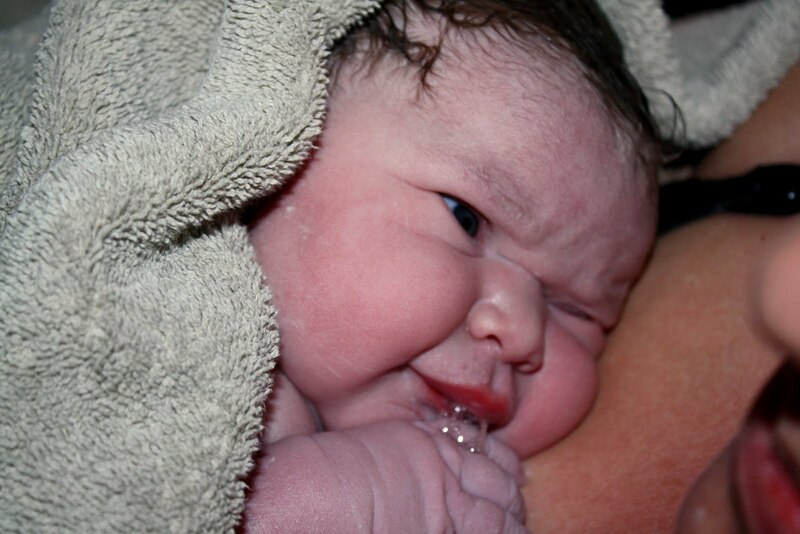 Chubby cheeks, dark hair, clearing her lungs quite loudly and covered in vernix. A cute little bum that fit in my hand, fingers long and the nails still a little purple, and I noticed the cord of my headphones disappeared beneath that little body. When Susan took the earbuds out of my ears and tried to pull the cord she couldn’t, so I lifted Bennett a little bit and we saw she had her first tightly wrapped around the cord! 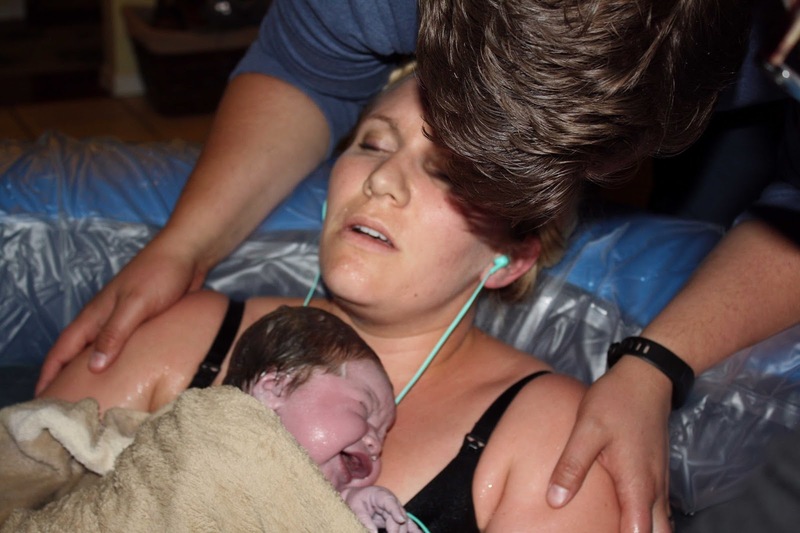 I got out of the pool before birthing the placenta and moved to our bed, that precious little bundle still on my chest. Once there I birthed the placenta, but again had a bit of retained membrane. This happened with Kenna and I had some minor hemorrhaging, and that danged membrane hung on for a couple of hours before coming out. This time we did some things beforehand to strengthen my blood, I took lots of Vitamin K to promote clotting, and cut down on things that could potentially thin the blood. My overall blood loss was about half of what it was with Kenna, and thankfully that membrane came out after 15 minutes or so. And guess what? I had some minor tearing, but no stitches! Hallelujah!!! Matt and I got some time alone with the baby, and in that time we talked about her name. The front runner for the name from 18 weeks on was Carina, but Matt wasn’t sold on it. I loved the middle name Rae, but at first Matt said it sounded like a boy’s name. Then I suggested Bennett for a middle name. Since the girls are already Palmers, I love the idea of having some of my family name in there as well, then when they’re older they can use Palmer as their middle name if they want—like I use Curran as my middle name now. Bennett is Ammah’s (my mom’s mom) maiden name. Not only that, but when I looked up the meaning and saw it meant “blessed” or “blessing” I felt it was perfect. Not to mention the fact it’s the last name of one of my favorite literary heroines. So we toyed around with Carina Bennett…but still weren’t settled. On Monday while Matt was in class he texted, “What about Bennett Rae?” and I loved it. We still decided to wait and see her face before making a final decision, and seeing those pink chubby cheeks we felt that our surprise blessing’s name was Bennett Rae. We did the newborn exam and found Benny Rae to be 21 ½ inches long, her head was 15 inches around, and she weighed a very surprising 10 lbs. 8 oz.!!! Our biggest baby! So if you’re pregnant and they’re trying to scare you that your baby is too big to birth naturally—take heart! I’m only 5’4” and this big baby has been the easiest recovery! Thanks for reading this novella. I love births and love talking about them, so if you have any questions at all please feel free to ask! We really thought we were done with our two girls, and I feel like God whispered, “but you don’t know what you’re missing” and gave us a surprise. Our hearts are thankful, even though I know we have a lot of challenging days ahead. For now, I’ll just get back to snuggling this squish and smelling that newborn head! She had a pretty good grasp on the cord! So lucky to have Susan as a midwife! Wow! She is gorgeous! now I know why you haven't been posting for a while. Congratulations! !